If the recent successes of Element and Bad North have taught us anything, it’s that the deep mechanical function of strategy games doesn't often work well when ported wholesale to a new platform. When you’re porting such a title, you really need to keep in mind the technical restraints of a console - and especially the limitations of a handheld - and aim to provide a new spin that hides greater nuance and agency beneath a bold new reinvention. It’s a problem that’s dogged strategy titles not specifically designed with a non-PC interface in mind, and one that gets even messier when you apply it to the vast options and scope of a grand strategy game. This is the problem that rests at the heart of Realpolitiks, and while it’s admirable for a developer to bring something as potentially intimidating in player choice as this to Nintendo’s latest machine, the slow and clunky movement of using Switch’s analog sticks and the small screen real estate afforded in handheld mode make it a chore to play at best. However, while the basic nature of this game being ported in its entirety makes it an odd fit for Switch’s lack of mouse and keyboard support, you can’t help but admire Polish developer Jujubee’s desire to give the console its first 'grand' strategy title. 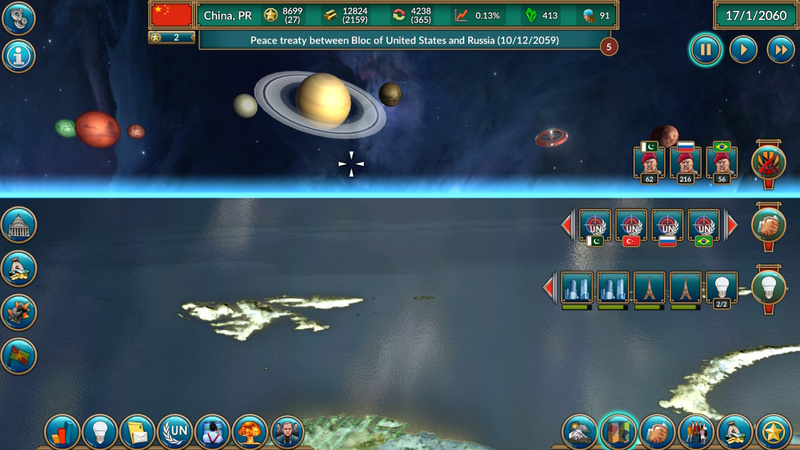 You can see it wants Realpolitiks to sit beside the greats such as Europa Universalis, Hearts of Iron and (more recently) Stellaris, and while it never quite nails the nuance that makes its inspirations so effective, it does an admirable job of making something so intimidating somewhat playable on another handheld platform, having already made its way to iOS. 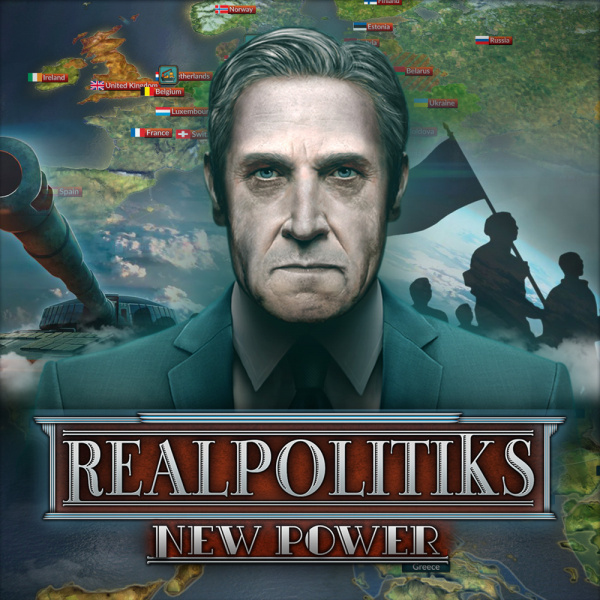 Boiled down to its composite parts, Realpolitiks is a strategy game set in the modern world. You can control a variety of contemporary countries from around the planet, and it’s your job to transform your nation into an impressive global power. How you do that is up to you. Do you build your state on the economic potential and diplomatic pragmatism of a democracy, risk the displeasure of your people by adopting a hardline model of authoritarianism or go all out and hold no quarter with a regime of totalitarianism? It’s certainly a fittingly topical subject given the ongoing state of global politics (and the real-world presence of all three ideologies), and with loading screen art depicting Donald Trump as a hotel bellboy or North Korea’s Kim Jong-Un dressed as a hipster, its developer clearly isn’t afraid to drop a little satire into the mix for good measure. Knowing winks to the audience aside, Realpolitiks is impressively vast in the myriad systems that unite its digital landscape. Each nation you select comes with its own unique ideology, national GDP and relationship to its neighbouring states, which in turn gives you a certain number of resources to work with. Do you ensure your country’s infrastructure is well-maintained, or do you hike up taxes and funnel the money into your military expansion? Doing the former will improve the well-being of your citizens, but follow a vision that’s too inward and you’ll fall behind in your global influence. Following a military route will give you more options, from using espionage to destabilise a rival to outright war, but it could likely lead to social unrest, sanctions from afar and an economy that implodes under the weight of conflict. There are just so many elements to consider, and it’s not helped by an unfriendly and unwieldy tutorial mode that does little to accurately dissect the depth at your fingertips. There is a Hints mode you can activate in the top left-hand corner of the screen, but it rarely provides anything rather than the occasional glimmer of assistance. This is the kind of game that would have benefitted from a vast fan-made Wiki, but in its absence, you’ll just have to implode a handful of working nations before you crack its formula, and that’s not going to endear this title to a casual audience. 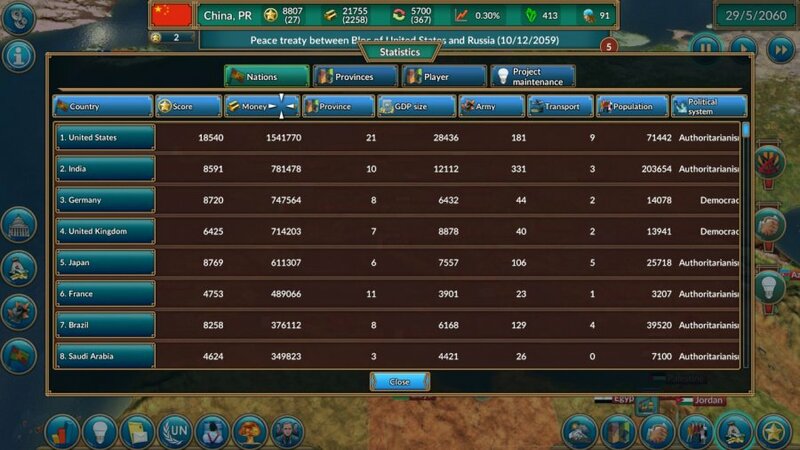 You can tackle this ever-changing diplomatic battlefield in one of three modes - The World is Not Enough is a freeform approach that enables you to pick a nation and expand and encroach as you see fit; The Dawn of Tomorrow wipes the geopolitical slate clean following a nuclear war, tasking you with rebuilding your state in the aftermath; and New World Order gives every nation the same opening stats in a race to become the highest ranked country in a given time. Of the three, the freeform mode offers the most scope but it also exacerbates the game’s biggest problems. For all your ‘freedom’ to secure trade deals or build allies against encroaching blocs, you’re constrained by some seemingly unnecessary limitations. You’re responsible for internal politics, foreign relations, domestic infrastructure and more, and yet you can only perform two tasks at once. Yes, you can speed up time to complete them but that only reduces the window in which you can reach the highest spot in the rankings. Dig a little deeper and you start to realise that depth isn’t quite so deep with everything from voting in the UN to signing off on military intervention resigned to an automated function that often yields little sense of tangible feedback. 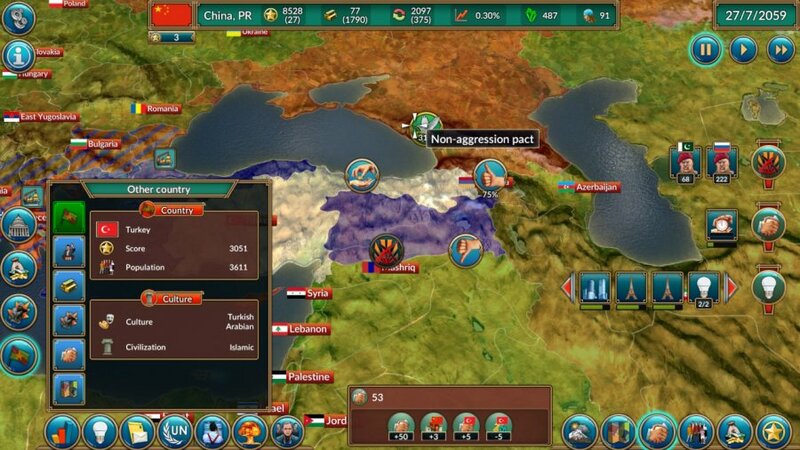 The end result is a grand strategy game that's not quite as grand as it appears to be. The Switch version comes with extra DLC packed in, so you are getting plenty of content should you feel the urge to scratch your grand strategy itch, and it runs relatively well with only the occasional instance of slowdown. 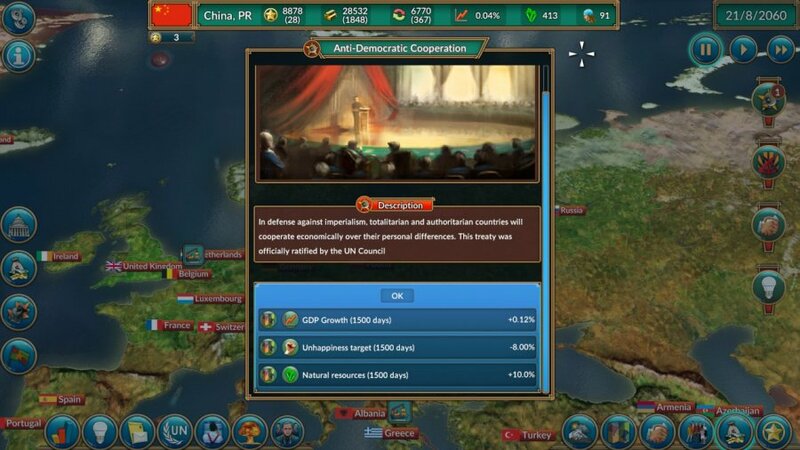 You can use Switch’s touchscreen to navigate the action, but without the larger screen of a tablet, Realpolitiks small on-screen buttons and submenus make for a fiddly experience at best. Realpolitiks really wishes it was something as grand as Europa Universalis, but in reality, it’s more akin to the Tropico games or a souped-up Football Manager. You have a lot of systems to manage, but the choices you make within these systems aren’t as open as we’d like and you're left spinning countless diplomatic plates without the agency befitting such a seat of power. The end result is a grand strategy game that struggles to find a middle ground between accessibility for newcomers and long-term investment for genre veterans. @Dom Thanks for the review, Dom! I had looked at this in the shop Sunday and decided it was best to wait, many of my worries turn out to be true. I'll wait for a Risk game to appear. Alright, this sounds a little too heavy for me. Thanks for the review! Not sure if I understood the first sentence in this review correctly. Wasn’t the port of Bad North a good one, or are there problems with it? @Sinton Fair point. Element and Bad North are good examples of a genre being reapproached in the right way for Switch, Realpolitiks is not. Wow, the guy on the cover looks absolutely THRILLED to be starring in his very own videogame, doesn't he? This looks like a poor man's Civilisation. I wish Paradox Interactive or Firaxis would make something for the Switch. A real in-depth strategy game is conspicuously absent from the Switch line-up. I'll just get Bad North instead. I thought it was Michael Douglas at first!!! Why is Robert Mueller on the cover? It is an interesting concept and as much as I do try to play everything on the Switch these days, I really don't think this sort of game would work very well on the device. I'd love a grand civilization style strategy game on the Switch, but it really does need to be built for the Switch, or at least built for consoles. Not ported from PC as an afterthought. @Painkiller_Mike "Robert Mueller's Real Indiktments"
Looks pretty boring, and only a 6. I missed the competition, but it doesn't look like I am missing much. It doesn't look like my cup of tea.